I’ve never had one. How about you? 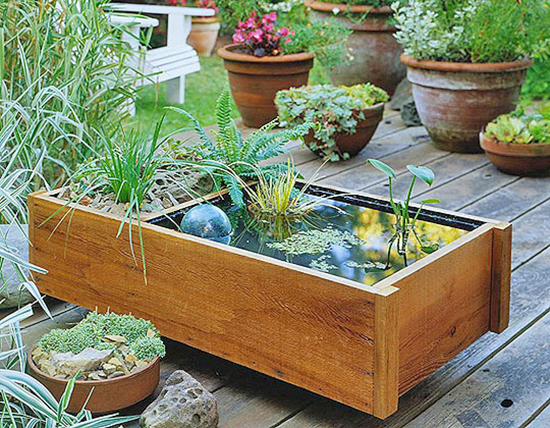 I’m loving the idea of a water garden in a container. 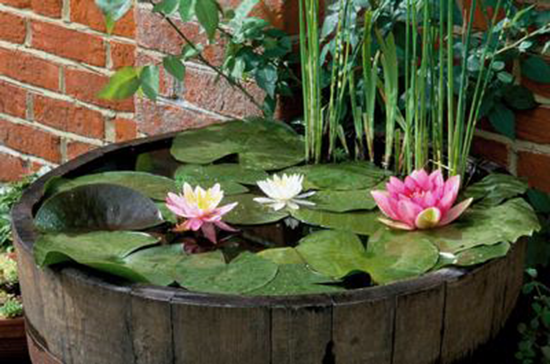 And from what I’ve read you can use just about any watertight container for your garden’s home. I’m into the look of this rusty blue tub. 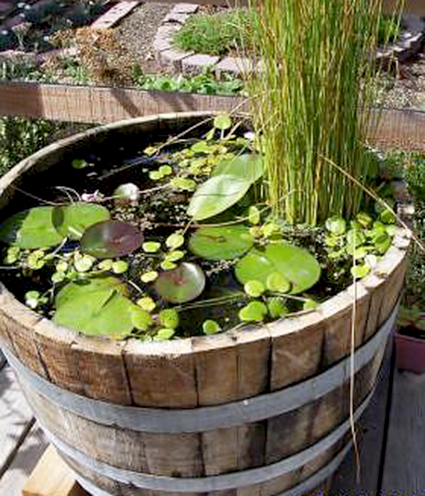 For a wooden container, just make sure you insert a liner to contain the water. Glazed ceramic containers are also a great choice. But there are so many decorative options out there, it might be hard to choose! What do you think about this gray container? Were you able to tell that it’s actually a molded plastic pot? 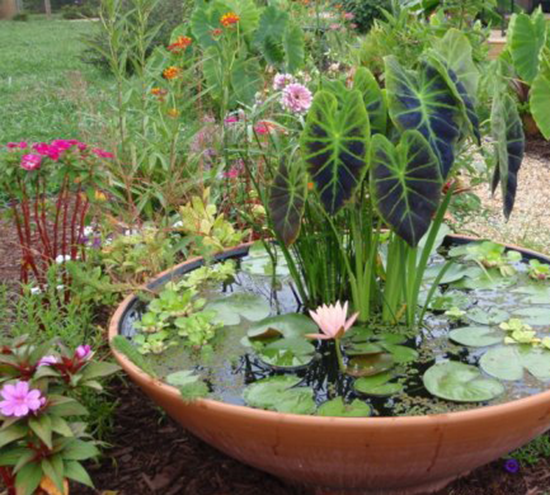 I love this water garden displayed in the terracotta saucer. If you look closely you can see a black liner, but if you can’t find a liner for your porous container, just be sure to seal the inside of it with a water sealer. Wine or whiskey barrels. They are by far my favorite! And the great thing is if they’re in good shape, they’ll already be watertight. But if not, you can also find liners for half barrels. 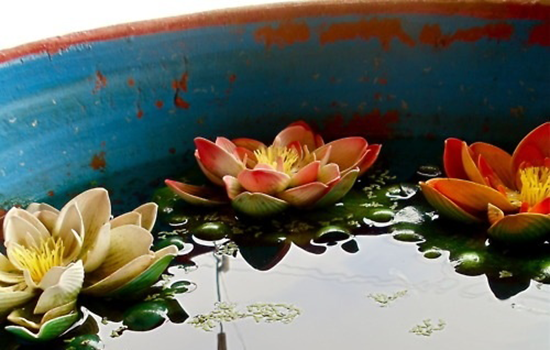 I’ve always thought water gardens were pretty cool, but have never entertained the idea of making one for myself. That is until now. If I give this a go, I’m heading over to Fresh Home Idea’s tutorial to help me out. 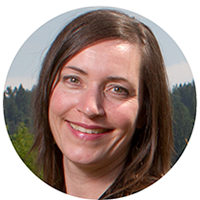 And for more information I might also refer to master gardener Sandy Metzger’s tips in this article. I’d love to know what you think about water gardens. If you’ve made one, do you have any tips to share? Photograph sources listed under each image. All the water gardens you posted look great, but my favourite is the rectangular wood box. I can’t even take care of my tiny little garden in the ground. I definitely don’t think I’m ready to graduate to water gardens!! I love the idea of it but our mosquitos have been so bad already this year that I think this might attract them even more. And how often do you think you need to replace the water? They are very pretty and I can’t wait to see if you give it a try. Bad news – my peace lily really isn’t doing well. I need to do some research on it and troubleshoot. So lovely, but I’m so not talented in that arena! Surely there’s something you could put in the water to deter mosquitoes? 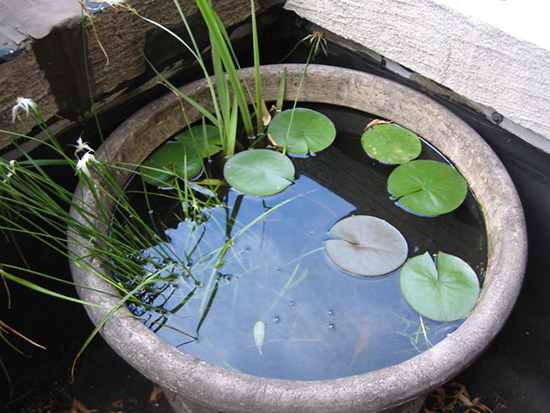 I hope to experiment with a little water garden …… if this rain continues, the plants that grow in my backyard dirt may start looking like water gardens!!!! I have two container water gardens. One holds a sacred lotus and the other holds a miniature yellow waterlily called Helvola. 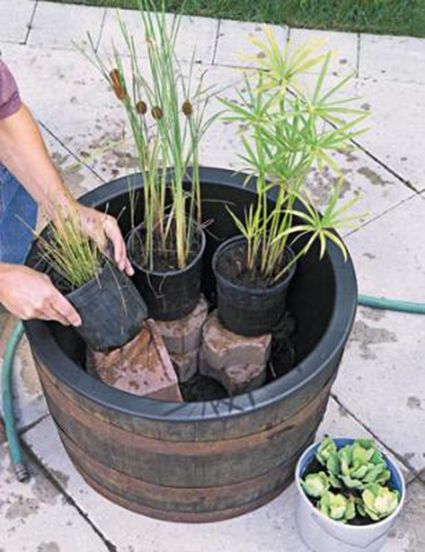 What’s great about container water gardens is that you don’t have to water them as much as soil containers. Plus the variety of plants is amazing. Just make sure you place it somewhere that gets at least 6 to 8 hours of direct sunlight. 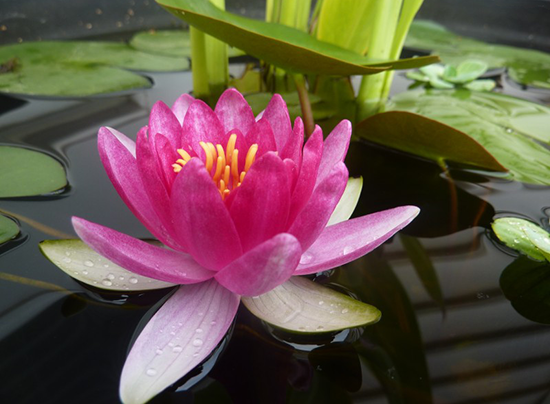 If you need help, there’s a step-by-step tutorial at http://www.aquascapeinc.com/index.php?page=articles&a_id=55. Hope you post pictures if you decide to create one! Thank you so much for stopping by! I really appreciate the tips you shared, and guess what? After reading your comments, I went out and bought a half wine barrel and liner! I just decided there’s no time like the present to dive in 😉 I’m going to take some time to think about what plants to start with, I will definitely buy a pump, and then give this a go. Once everything is in place, I’ll for sure post pics! 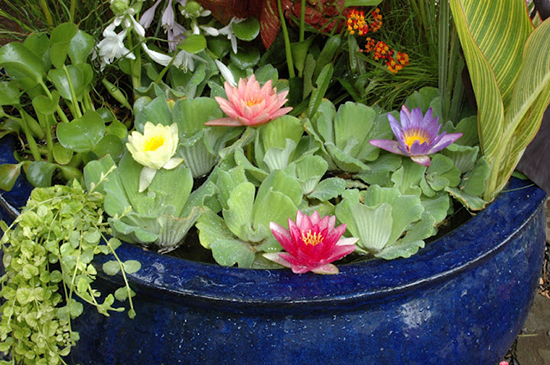 Years ago I had a water garden in a ceramic pot and I loved it. It had a little bamboo fountain, a small water lily and another tall plant (can’t remember what kind). The hole on the underside of the pot was just filled with some kind of putty. Voila, water tight. 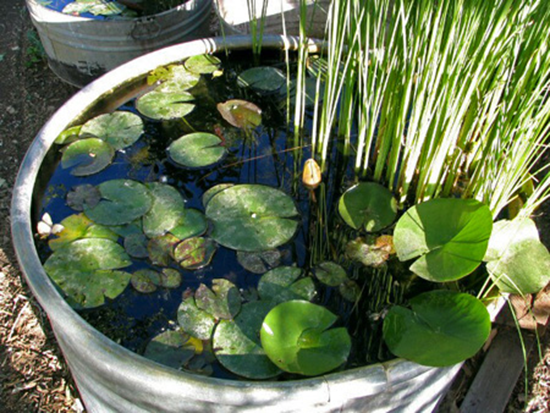 Come to think of it, I still have the ceramic pot…I may have to resurrect the water garden. There’s something wonderful about sitting in the backyard with the tranquil sound of trickling water. Thanks for the inspiration! That’s awesome, Meesh! You’re way ahead of me… I have to learn all about how to do this! But I did go out and buy an old half wine barrel and a liner to push me into getting on it. Now I have to read all the fine print 😉 If you resurrect your water garden, I hope you’ll post some pics. Have a great weekend! Thanks for including my water Garden. @ Holly- i change the water every 10 days or so. You can add mosquito dunk or fish (like I have) in there. 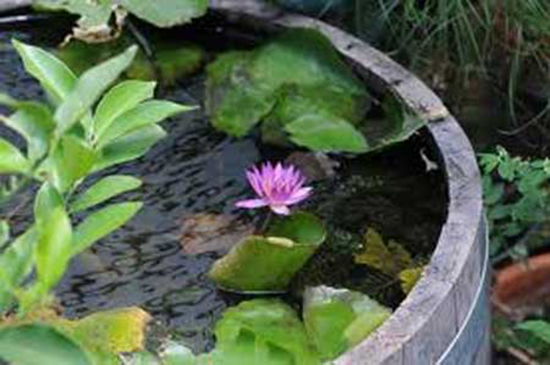 The fish takes care of both the mosquitoes and algae. Previous PostPrevious Bistro Chairs Beachside! Next PostNext Just When I Thought I Was Done!